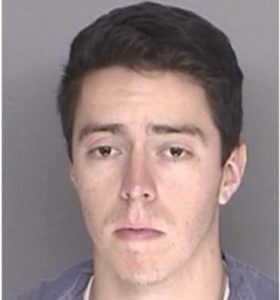 A University of California Santa Barbara student allegedly attacked and beat an Isla Vista pastor at his home on Fortuna Road on Saturday, according to a Santa Barbara County Sheriff’s Department press release. At approximately 2:15 a.m., Paul Gusman, 22, began knocking on the door of Father Jon-Stephen Hedges (affectionately known as Father Jon) and yelling for help. Gusman then began throwing his body against Father Jon’s front door. Fearing that someone was in desperate need of help, Father Jon opened the door to provide assistance, officers said. Gusman, who was naked from the waist down, then forced his way into the residence and punched Father Jon more than 30 times in the face. Fathers Jon’s wife was struck on the hand during the altercation. Despite the traumatic nature of the event, she managed to call 9-1-1 for help. When Santa Barbara County Sheriff deputies arrived, they found Gusman standing in the front yard. He appeared to be under the influence of a controlled substance and possibly intoxicated. Deputies arrested Gusman and booked him into the Santa Barbara County Jail on charges of assault upon a person with force likely to produce great bodily injury, residential burglary, elder abuse and dissuading a victim. His bail was is at $500,000. Emergency personnel transported Father Jon to a local hospital with major injuries. He was released from the hospital and is now with his family recovering from his injuries. Father Jon is a UCSB graduate and has lived in Isla Vista since 1968. He is an assistant pastor at St. Athanasius Orthodox Church and a volunteer Chaplain with the Santa Barbara County Sheriff’s Office. The assault is under investigation but preliminary indications are that it was a random attack and that the suspect was not acquainted with Father Jon. Why is the SLO County Grand jury investigating Los Osos? Is this not a Hate Crime???? And Cal Poly breathes a sigh of relief because this time, it’s not a Cal Poly student doing stupid stuff. Notice the trend in our society of the kind and compassionate people being victimized, sometimes as a direct result of their kindness, like in this case. It drives these people away and forces them to not trust or care about their fellow human beings. Most of us would have called 911 the instant someone began pounding on our door. When we lose people like this pastor we have no more community. Very sad. Ironically, the kid could not have picked a better victim. Fr. Jon-Stephen is very forgiving, very understanding, and he is usually first on the scene in places like Katrina, the UCSB killings, etc. He is a first-responder and a faith counselor (as well as an Archpriest in the Antiochian Orthodox Church). Truly one of the nicest guys I have ever met. “Try these drugs,” they said. “You’ll be cool,” they said. “You’ll feel great,” they said. I really would love to know what he was on, and hear what he can remember of how he decided taking drugs would be “cool” or whatever. Might be a lesson for others to learn, at least. Hopefully he’s still naked from the waist down. The other inmates there then can make this an episode of his life that Gusman will never forget, or repeat.